Smithsonian scientists have confirmed that chytridiomycosis, a rapidly spreading amphibian disease, has reached a site near Panama's Darien region, the last area in the entire mountainous neotropics to be free of the disease. The Darien National Park is a World Heritage site and represents one of Central America's largest remaining wilderness areas. Chytridiomycosis has been linked to dramatic population declines or even extinctions of amphibian species worldwide. Within five months of arriving at El Cope in western Panama, chytridiomychosis killed off 50 percent of the frog species and 80 percent of individuals. "Our project is one of a few to take an active stance against the probable extinction of these species. We have already succeeded in breeding three species in captivity. Time may be running out, but we are looking for more resources to take advantage of the time that remains." In 2007, Doug Woodhams, a research associate at the Smithsonian Tropical Research Institute, tested 49 frogs at a site bordering the Darien. At that time, none tested positive for the disease. In January 2010, however, Woodhams found that 2 percent of the 93 frogs he tested were infected. "Finding chytridiomycosis on frogs at a site bordering the Darien happened much sooner than anyone predicted," Woodhams said. "The unrelenting and extremely fast-paced spread of this fungus is alarming." The Panama Amphibian Rescue and Conservation Project has already established captive assurance colonies in Panama of two priority species endemic to the Darien—the Pirre harlequin frog (Atelopus glyphus) and the Toad Mountain harlequin frog (A. certus). In addition, the Smithsonian's National Zoo maintains an active breeding program for the Panamanian golden frog, which is Panama's national animal. The Panamanian golden frog is critically endangered. "We would like to be moving faster to build capacity," Gratwicke said. "One of our major hurdles is fundraising to build a facility to house these frogs. Until we jump that hurdle, we're limited in our capacity to take in additional species." Nearly one-third of the world's amphibian species are at risk of extinction. While the global amphibian crisis is the result of habitat loss, climate change and pollution, chytridiomycosis is at least partly responsible for the disappearances of 94 of the 120 frog species thought to have gone extinct since 1980. 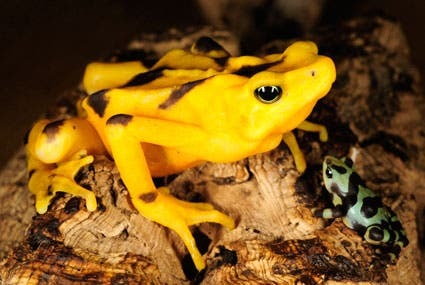 "These animals that we are breeding in captivity will buy us some time as we find a way to control this disease in the wild and mitigate the threat directly," said Woodhams, who was the lead author of a whitepaper Mitigating Amphibian Disease: strategies to maintain wild populations and control chytridiomycosis. "We are all working around the clock to find a cure," Gratwicke said. "Woodhams' discovery that defenses can indeed be transferred from parent to offspring gives us hope that if we are successful at developing a cure in the lab, we may find a way to use it to save wild amphibians."